Cannabis edibles are a large segment of the booming legal marijuana industry. While there is much to enjoy from these tasty edibles, they require careful creation and consumption practices, because a negative consumption experience is more possible with edibles than with any other cannabis concentrate product. This fact is not meant to alarm anyone interested in trying edibles; consumed properly and responsibly, there is much to be said for the cannabis edibles experience. Unfortunately, too may people tend to overdo their cannabis edibles consumption and adopt a “more is better” philosophy when the opposite approach is necessary for responsible edibles consumption. Always follow the “less is more” approach when enjoying edibles, even if you’ve developed a tolerance to cannabis when smoking it, whether it be straight flower or concentrates. Cannabis edibles are an entirely different type of cannabis consumption experience and should be treated as such. It’s human nature to overdo things we find enjoyable, whether it be sweets, fried foods, alcohol, or cannabis edibles. If you’ve enjoyed edibles in the form of homemade brownies or cookies, you’re at least familiar with them, but don’t let past experiences lull you into a sense of complacency. Eating “just one more” infused brownie may taste great, but if it’s a particularly potent brownie, you may unintentionally cross the line from an enjoyable cannabis experience to one that is unpleasantly strong. Do not think of “just one more” edible as being remotely like “just one more puff” off a bong, blunt, or vaporizer pen. Unlike smoking flower or concentrates, which are absorbed through the lungs into the bloodstream for an almost immediate effect, edibles break down slowly in the stomach and then the liver. As a result of these very different methods of consumption, there can be a long delay to experience the complete effects when eating edibles. If you purchase edibles from a dispensary, the potency level will be printed on the label. However, while this is a handy reference, don’t bank on the accuracy. Industry studies indicate that 60 percent of edibles sold have true THC levels lower than what’s on the label, with 23 percent containing a higher THC level than what’s printed on the label. That means that a relatively low percentage of labels—17 percent of them—are accurate when it comes to the actual dosage. With variances this high, those with a passion for edibles may choose to test their edibles with potency test kits intended for home use. Commercial cannabis companies sometimes are required to use third-party labs to conduct their testing. Any discussion of cannabis edibles should include an explanation of what decarboxylation is and why it’s necessary for creating edibles. Cannabis decarboxylation is a chemical process that eliminates a carboxyl group from cannabis and releases carbon dioxide. This converts the plant’s raw tetrahydrocannabinolic acid (THCA) to the active form of THC that produces the euphoric high that results when consuming the drug in smokable or edible form. Likewise, decarboxylation activates cannabidiolic acid (CBDA) to activated cannabidiol (CBD). This chemical process occurs when two critical factors come into play: time and heat. Only when heated for an adequate time duration does decarboxylation occur, which activates the THC found in flowers and makes it suitable for human consumption. When smoking or vaping marijuana, the combustion or extreme heating process is what activated the cannabinoids and converts the smoke or vapor to a usable state for absorption into the lungs. Cannabis must reach a temperature of at least 220 degrees Fahrenheit for 20 minutes for decarboxylation to occur. Some information sources suggest a longer, more intensive decarboxylation process with heat at 240 degrees Fahrenheit for nearly an hour for full THC activation and potency. Unfortunately, varying decarboxylation methods—including some that only partially decarboxylate the cannabis—sometimes result in inconsistent THC levels in the edibles. 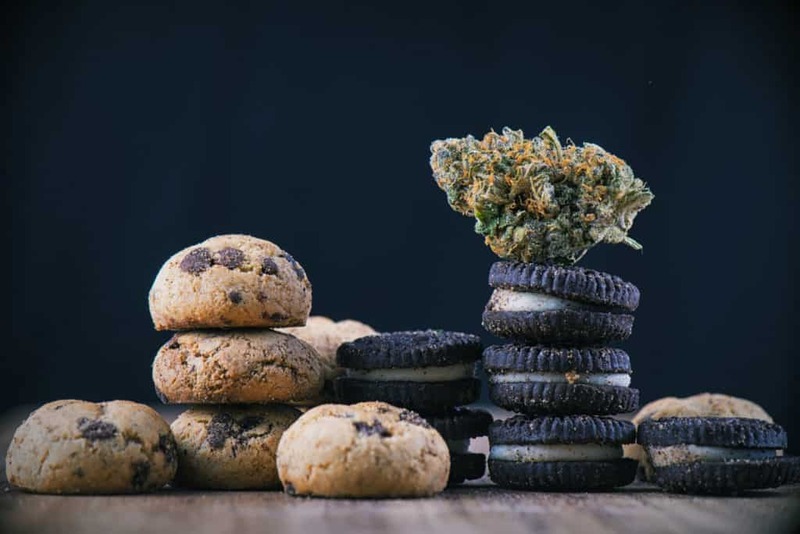 Baked good, one of the most popular forms of THC-infused edibles can easily result in inconsistent dosages per cookie or brownie if the infused oil or butter is unevenly distributed in the batter. Also, the baking process—which is typically done at 350 degrees Fahrenheit—can further decarboxylate the baked good so that finished product is much more potent coming out of the oven than when going in. Commercial cannabis companies typically use specific methods to infuse their edible baked goods and beverages. Because of the volume of products being prepared by these companies, infused cooking oils and oil concentrates typically replace cannabutter, which is impractical to use for the mass production of commercial products. The potency of cannabis edibles is often dictated by the state where they are made, as well as their intended purpose. Medical edibles typically have a much higher potency than recreational edibles. Using a dosing chart when preparing edibles will be necessary and useful for determining the potency of each edible. Let’s compare the THC levels printed on the labels of recreational edibles compared to medical edibles. Most recreational candies or baked good contain 10 mg. of THC—with an increasing number of companies opting to go lower, at 5 mg. THC—half the “regular recreational dosage.” The tendency to eat too much is that much of a concern for companies committed to safe consumption practices. Medical edibles, on the other hand, can go as high as 1,000 mg of THC or even as high as 1,200 mg. The difference between 5 mg and 1,000 mg is huge. Companies that produce high-potency edibles are creating them for seasoned edibles users. In the hands of an inexperienced cannabis edibles consumer, these products would be completely overwhelming. Although some edibles are extremely potent, there is no reason to fear them. Most likely you will not want to experiment with potent edibles with intended medical applications if you’re a person who enjoys only an occasional recreational edible experience. This is not unlike a beer drinker who enjoys beer in the 5.5 percent alcohol (11 proof) range instead of 95 percent (190 proof) Everclear™. You can buy the beer and Everclear in the same liquor store, but one packs a much more potent alcohol experience. Here are some good rules to help ensure your cannabis edibles experience is enjoyable and one you’ll want to repeat. Start low. Many recommendations for cannabis edibles consumption suggest starting at 5 mg for first-time use, while others suggest 10 mg. The point is to stick with a low dose. Wait for at least two hours before deciding to take more. Many unpleasant edibles experience occur because the person eating the edibles decided they weren’t working and took more too soon. Do not overconsume. Take a modest amount, especially during your first edibles experience. If you create your own baked edibles at home and test potency, be sure to test the final baked good and not the batter used to make it. Decarboxylation can occur when making the cannabutter as well as when baking the cookies or brownies. Remember that THC beverages provide a quicker THC experience than sweet or savory solid edibles that have to break down in your stomach. Consult one of the many edibles dosing charts and consume responsibly. Cannabis edibles are a growing segment of the legal marijuana industry, and many people enjoy them on a daily basis. Whether you create them yourself or purchasing them from a dispensary, they have uses for both medical and recreational cannabis consumers. If you enjoy cannabis but have never given edibles a try, consider doing so. For many people with an aversion to smoking or even vaping, it becomes their preferred method of experiencing cannabis. Proceed carefully, and enjoy!